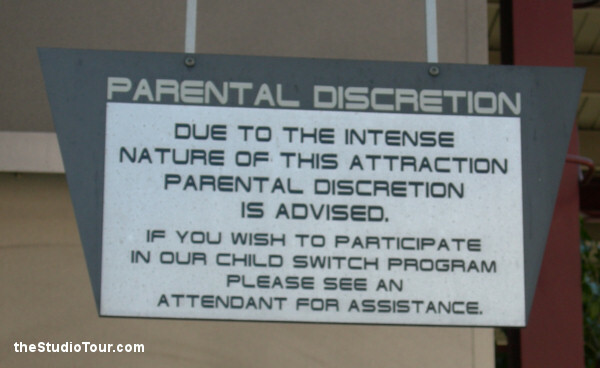 This attraction has now been replaced by Despicable Me: Minion Mayhem. 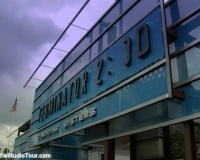 “Jump forward into the future – to the chilling, machine-controlled world of the Terminator. 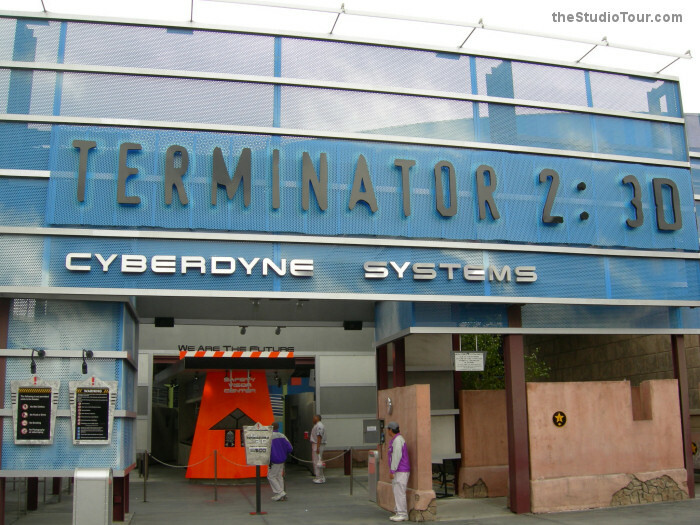 The Terminator 2:3D attraction was ground-breaking when it first opened in 1996 in Florida. 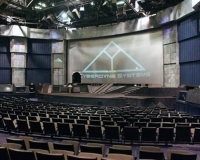 Three years later, Universal Studios Hollywood had a new purpose-built show building with a large preshow area (where Kimberley Duncan welcomes visitors to the Miles Bennet Dyson Memorial Auditorium for a presentation about the new defence technology) and a huge hi-tech theatre with three massive wrap-around 3D projection screens and a stage area. 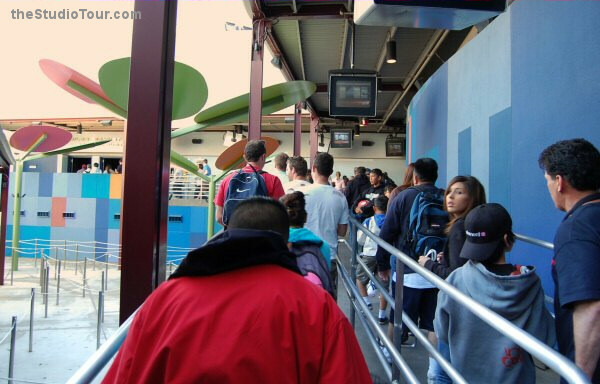 The fusion of live performers and 12-minute $60 million movie (the most expensive movie ever created per minute) produces a thrilling experience which is unrivalled in any other theme park show. 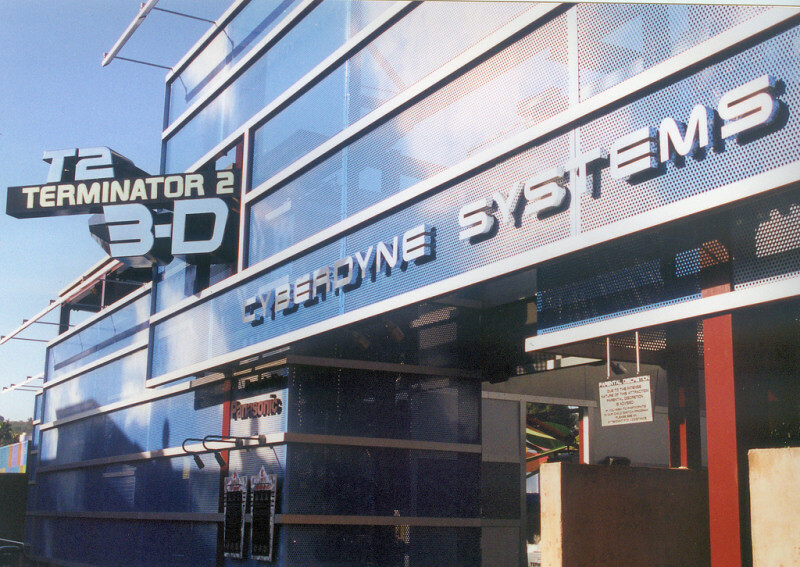 1992 – Landmark Entertainment begin work on the 3D film / live show concept. 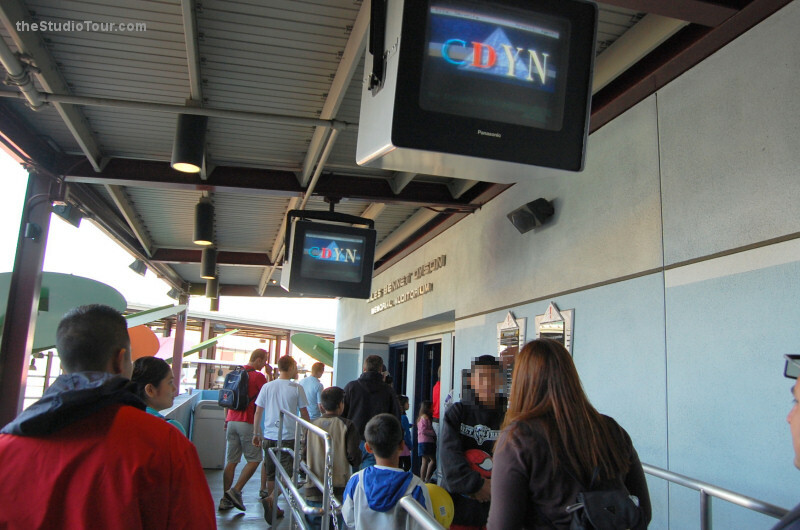 1995 – Landmark Entertainment begin work on the pre-show. 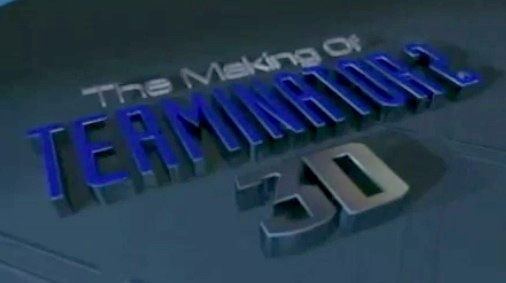 1995 – May/June – The 65mm 3D movie is shot. 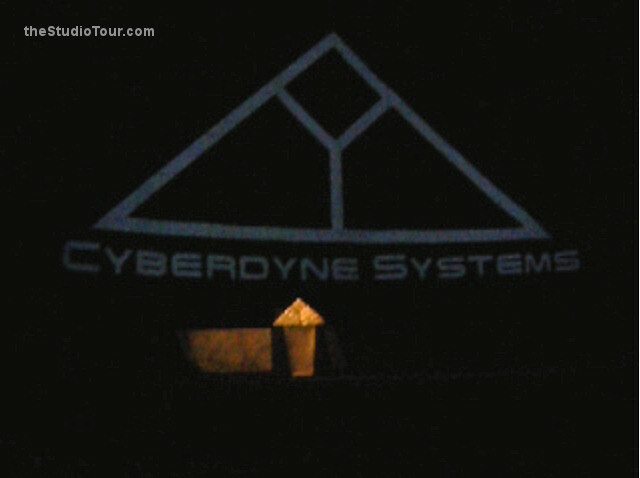 1995 – Digital Domain work on visual effects and rehearsals commence with the actors on a mockup of the theatre stage. Later in the year the video footage is shot and rehearsals continue in the show building to fully integrate the live actors and the filmed (65mm film and video) footage with lighting, sound, smoke, steam and animatronic effects. 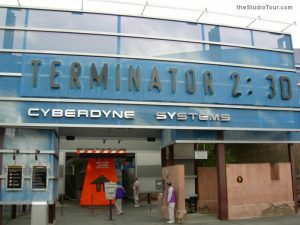 1996 – April – Terminator 2: 3D opens at Universal Studios Florida and is named “Best New Attraction for 1996” by Themed Entertainment Association. 1997 – January 2 – Preparation for the construction of the Hollywood version begins. 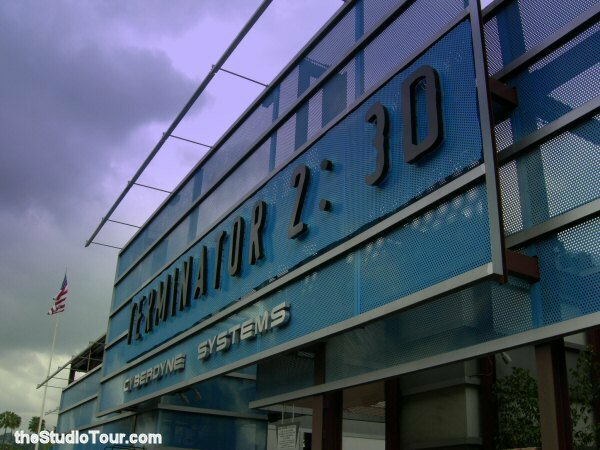 2001 – March 31 – Terminator 2: 3D Official Opening at Universal Studios Japan. 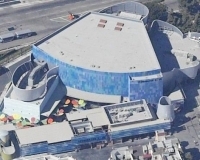 The T2: 3D show building (now the home of Despicable Me: Minion Mayhem) is constructed on top of the Frankenstein parking structure (previously known as the Laramie parking structure). Before 1999, the area was occupied with an outdoor stage. 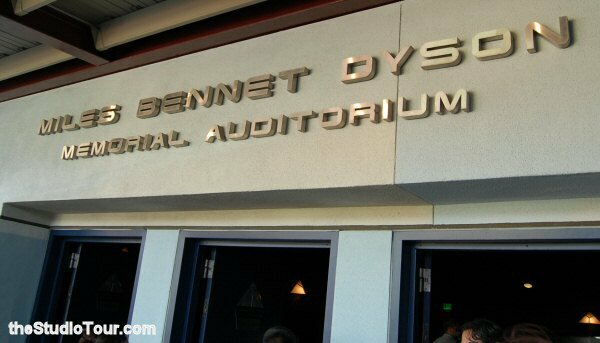 There’s a rumour that the force of the sudden drop of the auditorium seating at the climax of the show meant the parking structure suffered some minor structural damage as the show was being tested. The parking structure then had to be reinforced to take the extra load. 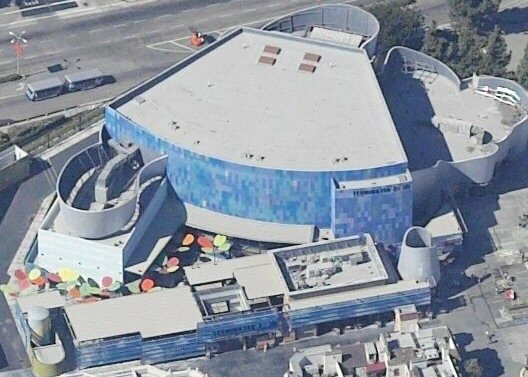 As can be seen from the aerial photo, the show building is split into 5 areas: at the bottom of the photo is the queue area with the distinctive coloured discs / sunshades. The block surrounded by the discs is the preshow Kimberly Duncan presentation area, then the bulk of the rest of the building is the large main auditorium. The side walls mirror the shape of the side screens, while the 4 brown air-conditioning units on the roof indicate the extent of the stage area. The section beyond this at the top of the photo is the backstage area. 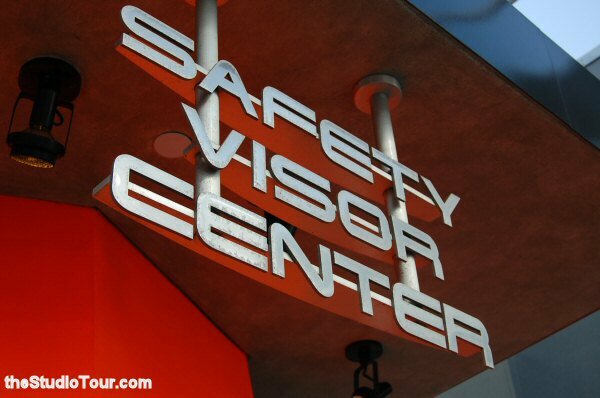 The block on the right side of the building houses break rooms and the T2 Gear & Supplies merchandise shop. 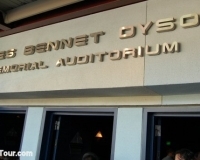 The auditorium is named the Miles Bennet Dyson Memorial Auditorium – named after the character played by Joe Morton in Terminator 2. 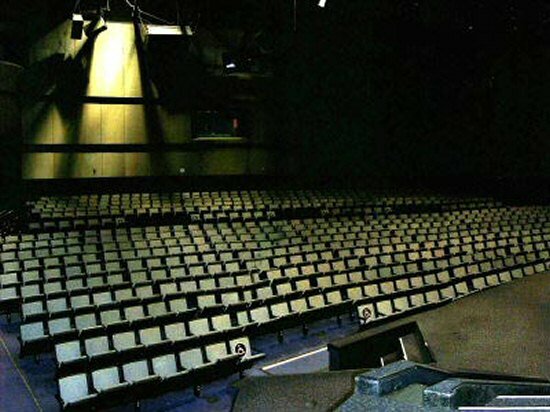 As well as the projection screens and seats, there are a large number of unique elements to keep the stunt performers and actors safe, including padding on the auditorium floor immediately in front of the stage, so that the actors don’t injure themselves when falling off stage. 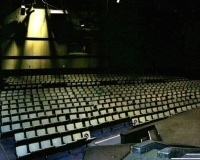 The auditorium can accommodate 675 guests. 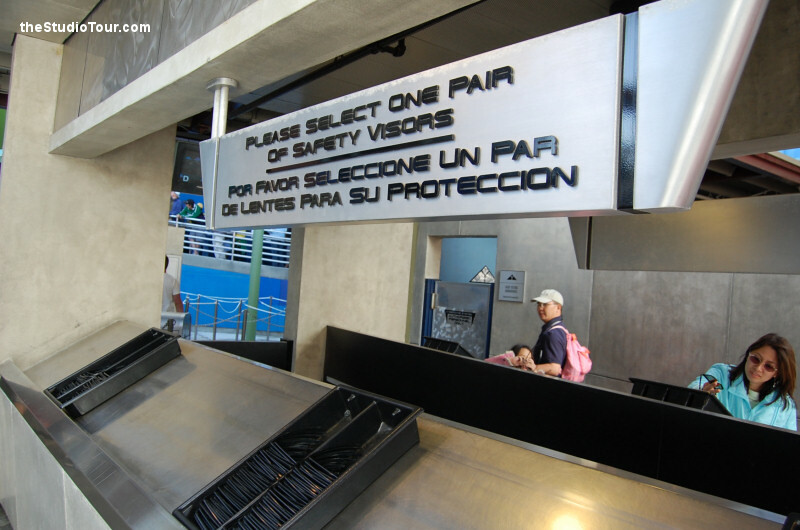 During construction work to remove the T2:3D elements from the show building, as it transformed into Despicable Me: Minion Mayhem, a fire was started by a worker’s welding torch. 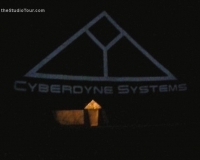 From the architect’s website: The attraction is housed in the fictional headquarters building of the Cyberdyne Corporation of the Terminator movies, and the design incorporates ideas that follow from the company’s fictional technologies. 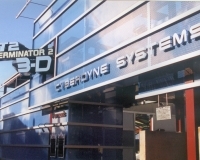 The theater building carries a pattern of ‘pixels’ abstracted from the visuals used for the Terminator’s computer screen visual field, and is punctuated by biomorphic curves of silver-gray: Cyberdyne’s ‘morphing liquid metal’. The adjoining Aquazone Plaza was developed as an outdoor alternative to a conventional feature entertainment. It is centered around an elaborate interactive water feature and provides resting and outdoor dining areas. 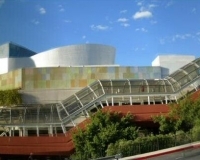 The project (along with the Aquazone Plaza) was awarded the Los Angeles Business Council Urban Beautification Award in 2000. While the building was under construction, there was a display of George Barris’ car collection. There are actually three separate movies that make up the main presentation. all synchronised together. With a total running time of 12 minutes, and a reported cost of $60million, this remains the most expensive movie ever made (per minute of screen time). 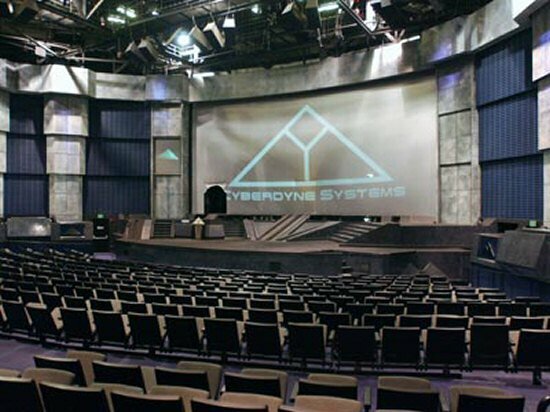 The first few minutes of the movie take place on the live-action stage of the theatre. 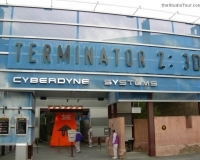 Once a time portal is opened, the live actors are catapulted into the future to begin their quest to destroy Skynet, and the main movie screen is filled with 3D action. 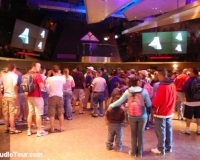 A few minutes later, the movie expands out onto two additional screens completely filling the audience’s vision span with three massive 3D projections. The project is a collaboration between Landmark Entertainment, Lightstorm Entertainment (James Cameron’s company) and Universal Creative. 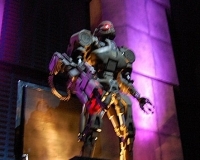 Special effects for the film were the work of Cameron’s Digital Domain and Stan Winston Studio. The film was shot on 65mm film and was printed on 70mm film. 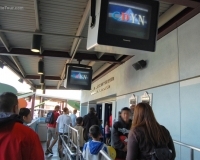 Two 70mm projectors are used for each screen (one for the left eye image, and one for the right eye image), meaning that six projectors are needed for the three screens used in the attraction. The film runs at the increased frame-rate of 40 frames per second (normal movies run at 24 fps) to increase the audience’s perception of the reality of the film / live action blend. 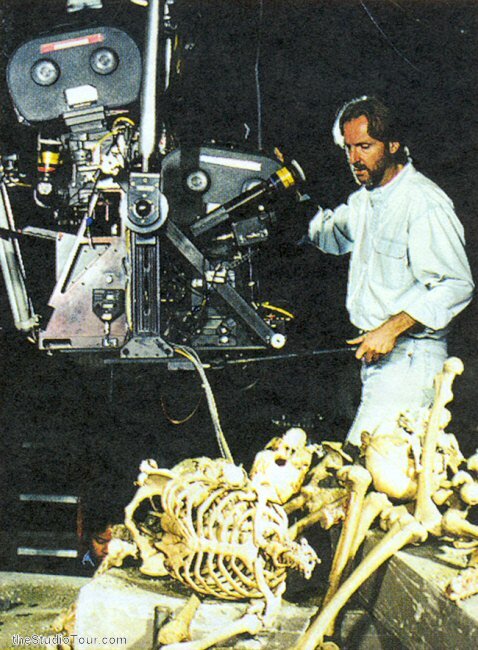 James Cameron directed the first section of the movie (and had an overview over the whole project, obviously). When the flying Hunter Killer chases them into a parking garage, mechanical effects genius Stan Winston (Jurassic Park, Terminator) takes over the reins, and then for the final sequence inside Skynet (where all three projection screens are in use) visual effects supervisor John Bruno directed. Each of the three movie screens in the main auditorium has two projectors focused onto it. Projector 1 carries the image for the left eye, and projector 2 carries the image for the right eye. Both projectors are aligned together exactly and synchronised so they keep perfect time together. The images from each projector are polarised relative to each other. 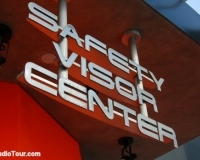 The ‘Safety Visors’ we wear when we watch the show have polarising lenses which mean that our eyes only receive the image from one of the two projectors on each screen. Slight differences in the position of the actors on the film in each projector allow our brains to ‘see’ the 3D position information that existed when the film was shot. Due to the precise action required of the motorcycle (it has to travel through the screen at exactly the right moment, in exactly the right place, every time), the motorcycle is on a track, and is controlled by a computer which synchronises the movement across the stage with all the other show elements. The Making Of video shows that during rehearsals, the team originally planned to use a real motorcycle with stunt rider. The motorcycle in the attraction is a custom-built Harley Davidson “Fat Boy”. 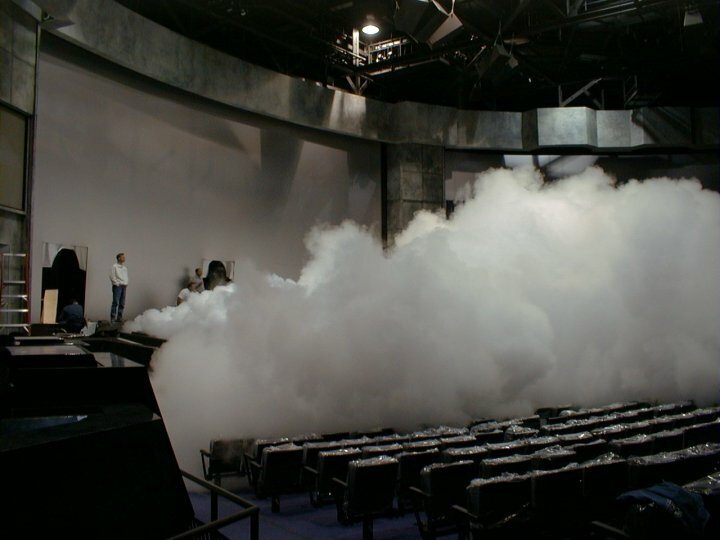 The white cloud which envelops the audience at the end of the show is provided by three high pressure steam boilers, provided by Parker Boiler (www.parkerboiler.com) in conjunction with nitrogen cannons. The photo above also reveals the two portals in the central projection screen through which performers enter the action seamlessly. 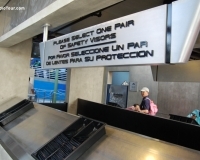 The whole central screen is on a moving frame which lifts up to allow the performers through the screen before dropping instantly to hide their route through. 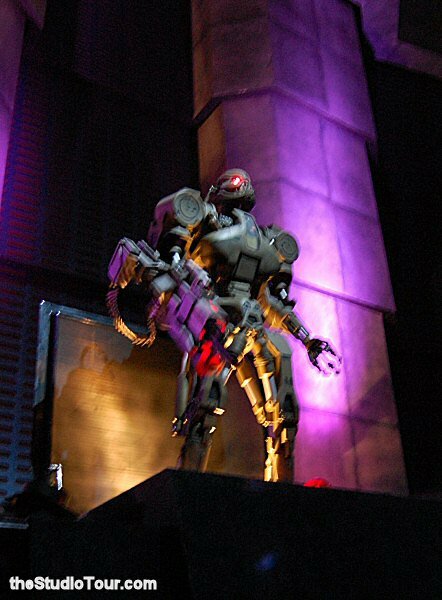 The music for the filmed part of the attraction was specially composed by Brad Fiedel (composer of the music for the first 3 Terminator movies). There’s been no commercial release of the soundtrack to the movie. 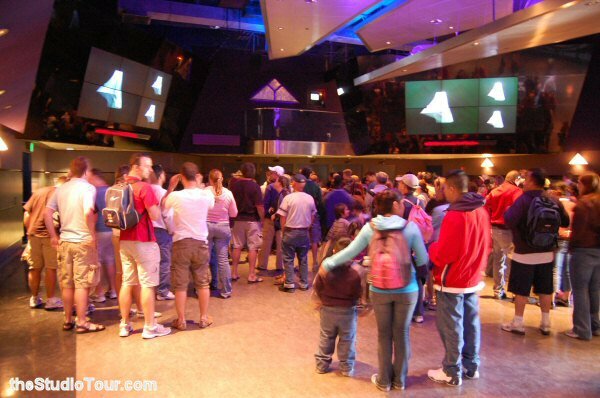 The music which features in the preshow queue area and movie was not composed by Mr Fiedel. A motorcycle (modelled after the Harley Davidson ‘Fat Boy’ used in the show) was parked as part of a display at the exit to the attraction. Adjacent to the T2 Gear and Supply Store entrance / exit, there was also a display cabinet showing an exo-skeleton, along with a sword, that was last used in the Adventures of Conan live show in the Castle Theatre.